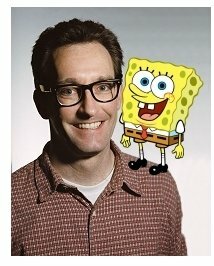 Tom Kenny – From SpongePedia, the biggest SpongeBob-wiki in the world! Thomas James Kenny ((born July 13, 1962 in East Syracuse, New York) is an American voice actor who is married to Jill Talley, the voice of Karen on the Nickelodeon TV comedy SpongeBob SquarePants. Tom Kenny does voice work for cartoons, video games, and commercials. He has described himself as "a man of a thousand voices" who is the well known comedian perhaps best known for his work in the animated comedy "SpongeBob SquarePants", in which he is the voice of SpongeBob, the French narrator, Patchy the Pirate, Mr. SquarePants, Gary, Old Man Jenkins, and more additional characters. He also voices the Ice King in Adventure Time with Finn and Jake. Rabbit From Winnie the Pooh 2011 Replaced By Ken Sansom Scoutmaster Lumpus, Slinkman, Milo, Big Hairy Mountain Man, The Real Scoutmaster of Camp Kidney, Clyde, And Big Bean from Camp Lazlo Tom Kenny was also the lead singer for a Syracuse-based rock band, the Tearjerkers, in the early-1980s. He replaced original vocalist Buddy Love. Tom Kenny came full-circle with his musical past in 2006 when he co-wrote and recorded SpongeBob SquarePants: The Best Day Ever. While Kenny's singing on the CD is done in the voice of SpongeBob and other characters from the show, he was very serious about the quality of the actual music on the disc and was able to get enlist help from such musical royalty as Brian Wilson, Tommy Ramone, and Flaco Jimenez. The music pays homage to the Beach Boys, the Archies, the Lovin' Spoonful, and the Troggs, among others. This page was last modified on 5 February 2017, at 17:27. This page has been accessed 25,393 times.